How do I determine the price of my pin? Quantity - the total number of pins ordered in one style with the same title is the quantity used for the price. Colors- Some pins can be ordered with 1 or 2 colors of enamel to highlight the design and lettering on the pin. 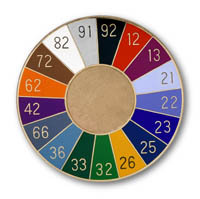 The description for each pin specifies the number of colors that can be added to the pin. Once use have selected a pin and decided on the quality and colors, you use the price that corresponds with the quantity being ordered. Am I ordering a one or two color pin? A pin ordered in gold electroplate with blue or a pin ordered in bronze with red is a one color pin. A pin ordered with black and white or blue and red is a two color pin. The metal quality is not considered a color. What is Bale Brite White? This is the name we use for pins and medals ordered with silver like finish. It is not sterling silver. Yes. We can ship your order to be delivered in 1, 2 or 3 days. However, if the item you order is not in stock, you still need to allow time for the processing and production of your awards. Our normal production schedule for items with engraving, stamped letters or special colors is 4 weeks. Some items (EA medals, SR medals, M series and D series pins) are in stock for immediate shipment. If you need a "rush" order, please call customer services to confirm product availability. Can titles be changed from one style of pin to another? No, the titles are not interchangeable. Each pin is made from it's own die. If a title is not listed with a particular pin style, we do not have a die for that title. I am ordering my awards for an honors assembly, but I not sure how many awards I will need. If I order more than I need, can they be returned? Where are the Bale Company products manufactured? All Bale Company products are made in the USA. What are the enamel colors? What are the ribbon colors?